Cardio Tennis is a series of tennis-based drills and activities played to up-tempo music on a tennis court. It does not require tennis skills but it is all about keeping your heart rate up, burning calories and having fun. Whether the ball goes in or out is irrelevant as the main purpose is to get fit. Cardio Tennis includes a warm-up, cardio work out, and cool down phases. If you are looking for a great new way to get in shape and to burn calories, why not try it? There are drills for absolute beginners through to advanced players, all of which provide you with a great cardio work out while improving skill. It is more fun than working out in a gym or other forms of exercise. 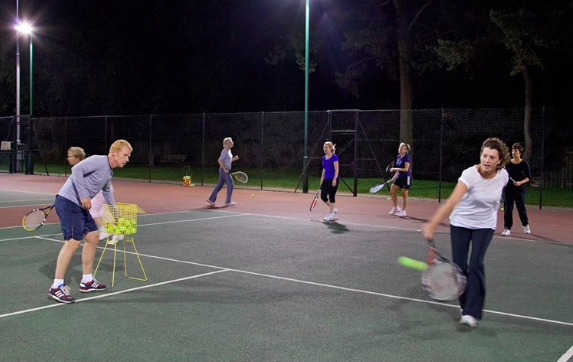 The tennis workout session takes place on one of our tennis courts and is run by a qualified tennis coach. The main purpose of the session is to provide you with an enjoyable work out. It’s not about forehands and backhands, it’s about getting in to your appropriate cardio zone and getting a great workout. Music is played during the session to help create a high energy atmosphere and add motivation. Get fit tennis is becoming increasingly popular and participants are advised to wear heart rate monitors so they can see if they are working hard enough (or too hard). The heart rate monitors also provide an accurate summary of the session including how many calories have been burned.